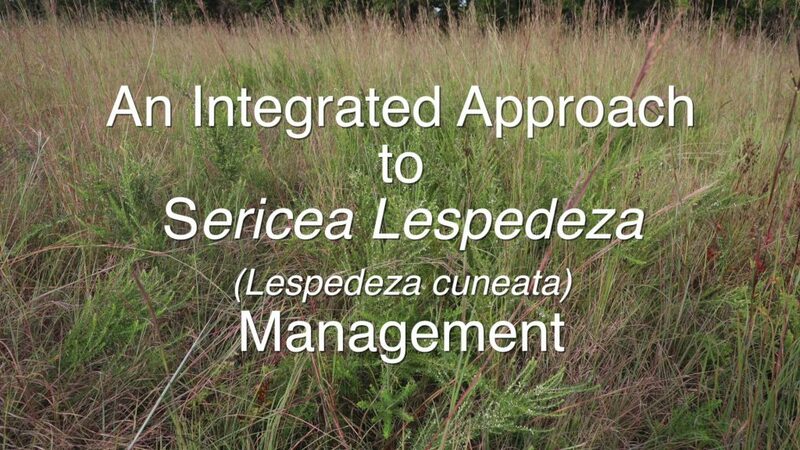 New NBCI video provides management strategies for sericea lespedeza. To assist land managers in controlling of one of the most invasive, problematic, exotic weeds in northern bobwhite range, the National Bobwhite Conservation Initiative (NBCI) has released a new 8-minute video, An Integrated Approach to Sericea Lespedeza Management … and just in time to begin control treatments this year. “For all practical purposes, sericea is impossible to eliminate,” said NBCI Grasslands Coordinator Jef Hodges. “It thrives under common wildland management practices. It’s a perennial and is allelopathic, which means it creates a chemical barrier to other plants. 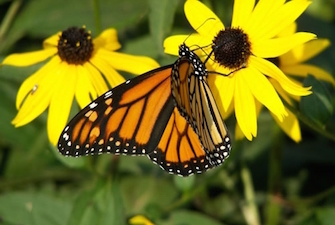 Its hard seeds will last decades in the soil, but they provide little nourishment to wildlife. In 2003, it infested an estimated 8.3 million acres, so it’s a threat to cattle producers as well as wildlife managers. It can’t be totally eliminated but it can be controlled with an integrated approach of burning/grazing/mowing and herbicide application for the most severe infestations,” said Hodges. The video is available for viewing at https://www.youtube.com/watch?v=jttBd6b4Ap8. The National Bobwhite Conservation Initiative (NBCI) will sponsor a webinar on the appropriate use of understory herbicides as a component in the management for woodlands, especially southern pines, for bobwhite quail and other grassland wildlife species May 31 at 2 p.m. (Eastern). Joining Chapman will be primary webinar presenter Ryan Mitchell of The Longleaf Alliance. Mitchell has a B.S. in Wildlife Science from Auburn University and worked with the Alabama Wildlife Federation to execute their longleaf restoration project through technical assistance to landowners. He is a past-president of the Alabama Prescribed Fire Council, a certified prescribed burn boss and a member of The Wildlife Society. The National Bobwhite Conservation Initiative (NBCI) is expanding support for a native vegetation standard in the next Farm Bill among a diverse array of organizations and is welcoming additional supporters to help influence agricultural policy discussions in Congress. Bamert Seed Company, Boone & Crockett Club, Chesapeake Valley Seed, Chesapeake Wildlife Heritage, Congressional Sportsmen’s Foundation, Ernst Conservation Seeds, FDC Enterprises, Izaak Walton League of America, Kansas Grazing Lands Coalition, Landmark Turf & Native Seed, Missouri Prairie Foundation, Mule Deer Foundation, National Association of Forest Service Retirees, National Association of Invasive Plant Councils, National Bobwhite Conservation Initiative, National Wild Turkey Federation, National Wildlife Federation, North American Butterfly Association, North American Grouse Partnership, Oklahoma Invasive Plant Council, Park Cities Quail, Pheasants Forever/Quail Forever, Placedo Prairie, Prairie Moon Nursery, Quail Coalition, Quail and Upland Game Alliance, Quail and Upland Wildlife Federation, Quality Deer Management Association, Roundstone Native Seed, Ruffed Grouse Society, South Carolina Native Plant Society, Southeastern Grasslands Initiative, Tanner Dog Farms, Tennessee Native Plant Society, Tennessee Naturalist Program, Texas Pollinator Powwow, Texas Wildlife Association, The Nature Conservancy, Theodore Roosevelt Conservation Partnership, The Pollinator Partnership, Union Sportsmen’s Alliance, Wild Sheep Foundation, Wildlife Forever, Wildlife Management Institute, Wildlife Mississippi. The U.S. Forest Service’s Southern Region has joined with the National Bobwhite Conservation Initiative (NBCI) in efforts to restore wild bobwhite quail at the landscape level. The new memorandum of understanding formalizes existing efforts on five national forests in Alabama, Georgia, Louisiana, South Carolina and Mississippi. The new agreement also provides a path for additional efforts at other national forests in the region, as well as on private lands whose owners are engaged with the federal agency in management activities. In conjunction with the respective states, NBCI will serve as a consultant on grasslands habitat design and development, and assessment of project progress. Headquartered at the University of Tennessee’s Institute of Agriculture/Department of Forestry, Wildlife and Fisheries, NBCI is a science and habitat-based initiative of the National Bobwhite Technical Committee (NBTC) to elevate bobwhite quail recovery from an individual state-by-state proposition to a coordinated, range-wide leadership endeavor. The committee is comprised of representatives of 25 state wildlife agencies, various academic research institutions and private conservation organizations. Support for NBCI is provided by the Federal Aid in Wildlife Restoration Program, state wildlife agencies, the Joe Crafton Family Endowment for Quail Initiatives, the University of Tennessee, Quail & Upland Game Alliance, Park Cities Quail and Roundstone Native Seed. 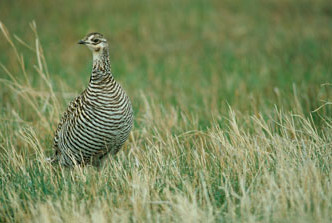 The 10,000-acre Chickasaw National Recreation Area in south central Oklahoma has become the third National Park Service (NPS) unit to join forces with the National Bobwhite Conservation Initiative — and in this case the Oklahoma Department of Wildlife Conservation — to restore grassland ecosystems, including wild bobwhite quail, grassland songbirds and pollinators, to the American landscape. The work is proceeding under an agreement between NBCI and NPS signed last year that provides a formal mechanism for the two entities to work together, along with the respective state wildlife agencies. The purpose is to collaboratively identify and restore native grasslands habitats on suitable park properties, with certain park units serving as formal bobwhite focal areas. Pea Ridge National Military Park in Arkansas and Manassas National Battlefield Park in Virginia were the first two NPS units to join the effort. Chickasaw, which allows hunting and already harbors some bobwhites, will develop a 5,000-acre bobwhite focal area. Spring call counts were conducted this year and covey counts (both required for NBCI’s Coordinated Implementation Program accreditation) are underway. The landscape is a mix of prairie and woodland types. Eastern red cedar trees have invaded the prairie areas and the park launched reclamation efforts two years ago, eliminating 1,000 acres of invasive cedar trees and conducting annual prescribed burns to maintain control and allow natural prairie regeneration. Another 1,000 acres of cedars have been targeted for removal. The park has also partnered with the Oaks & Prairies Joint Venture and hopes to interest a local university to assist with habitat assessment and bird surveys as well. “The National Park Service has done an outstanding job over the years in managing for wildlife at the Chickasaw National Recreation Area,” said J. D. Strong, director of the Oklahoma Department of Wildlife Conservation. “The initiative they undertook a few years ago to remove cedar trees and their ongoing prescribed fire work is as impressive as any habitat project in the state. This restoration work is not only good for quail, deer, turkey and other wildlife – they are also making for a safer and healthier ecosystem on the area. It is also exciting to have the National Bobwhite Conservation Initiative join forces with us. I have no doubt that the new quail monitoring efforts will show that the work they are doing is making a real difference,” Strong said. The mission of the Oklahoma Department of Wildlife Conservation is the management, protection, and enhancement of wildlife resources and habitat for the scientific, educational, recreational, aesthetic, and economic benefits to present and future generations of citizens and visitors to Oklahoma. Headquartered within the University of Tennessee Institute of Agriculture, Department of Forestry, Wildlife and Fisheries, NBCI is an initiative of the National Bobwhite Technical Committee (NBTC) to elevate bobwhite quail recovery from an individual state-by-state proposition to a coordinated, range-wide leadership endeavor. The committee is comprised of representatives of 25 state wildlife agencies, various academic research institutions and private conservation organizations. Support for NBCI is provided by the Federal Aid in Wildlife Restoration Program, state wildlife agencies, the Joe Crafton Family Endowment for Quail Initiatives, the University of Tennessee, Quail and Upland Game Alliance, Park Cities Quail and Roundstone Native Seed. The USDA Farm Service Agency (FSA) is contracting with the National Bobwhite Conservation Initiative (NBCI) for a $135,000 study of the impact of the Conservation Reserve Program (CRP) on bobwhites and grassland songbirds. The contract comes on the heels of a Memorandum of Understanding between NBCI and FSA last month, which established NBCI’s potential role as a consultant on various facets of the program. NBCI’s CIP-branded focal areas are being targeted in the study because they are designed to rigorously test the contribution of habitat management to abundance of bobwhites and grassland birds. Requirements include habitat measurements and prescriptions, and monitoring of bobwhite and grassland bird abundance during different times of the year. 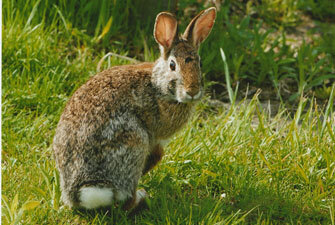 It does not, however, include any measurement of specific habitat programs, such as CRP. The study will add that measurement, as well as analysis, on those focal areas. Among the candidates for participation in the study may be focal areas in Kentucky, Missouri, Nebraska, Ohio, Iowa, Indiana, New Jersey and Texas. Headquartered at the University of Tennessee’s Institute of Agriculture’s Department of Forestry, Wildlife and Fisheries, NBCI is a science and habitat-based initiative of the National Bobwhite Technical Committee (NBTC) to elevate wild bobwhite quail recovery from an individual state-by-state proposition to a coordinated, range-wide leadership endeavor at regional and national levels. The committee is comprised of representatives of 25 state wildlife agencies, various academic research institutions and private conservation organizations. Support for NBCI is provided by the Federal Aid in Wildlife Restoration Program, state wildlife agencies, the Joe Crafton Family Endowment for Quail Initiatives, the University of Tennessee, Quail and Upland Game Alliance, Park Cities Quail and Roundstone Native Seed. The National Bobwhite Conservation Initiative (NBCI) and the National Wild Turkey Federation (NWTF), both requiring the creation and management of early successional habitat for success, renewed their commitment to working together at the 2017 Association of Fish and Wildlife Agencies’ annual conference in Sandy, Utah recently. 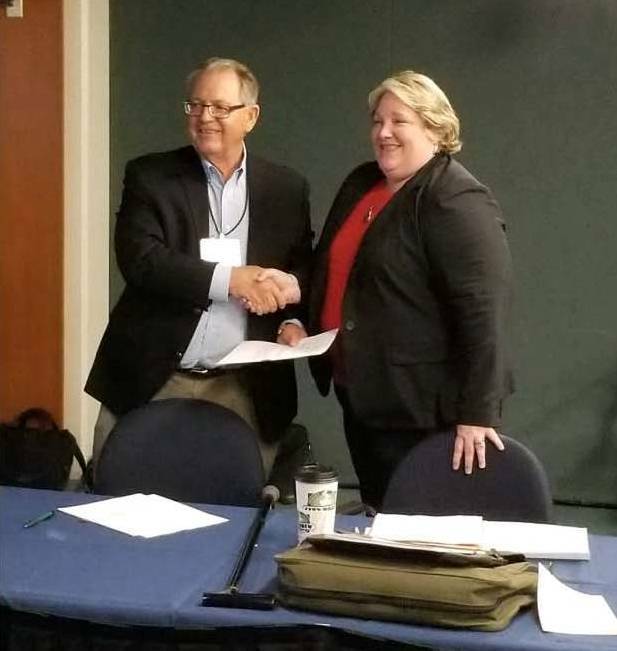 Jim Douglas, director of Nebraska Game & Parks and vice chair of the NBCI Management Board, and Becky Humphries, NWTF’s chief executive officer, signed the commitment. Both groups share mutual goals for upland wildlife habitat enhancement and restoration across public and private lands. Both organizations have designated focal regions in which to concentrate their efforts and, in many cases, there are commonalities, creating opportunities for collaboration and coordination in implementation. Headquartered at the University of Tennessee Institute of Agriculture’s Department of Forestry, Wildlife and Fisheries, NBCI is an initiative of the National Bobwhite Technical Committee (NBTC) to elevate bobwhite quail recovery from an individual state-by-state proposition to a coordinated, range-wide leadership endeavor working at regional and national levels. The committee is comprised of representatives of 25 state wildlife agencies, various academic research institutions and private conservation organizations. Support for NBCI is provided by the Federal Aid in Wildlife Restoration Program, state wildlife agencies, the Joe Crafton Family Endowment for Quail Initiatives, the University of Tennessee, Quail and Upland Game Alliance, Park Cities Quail and Roundstone Native Seed.For more information, visit bringbackbobwhites.org. A military installation, a native seed company, a cranberry company and a U.S. Fish & Wildlife Service national wildlife refuge were among recipients of the 2017 NBCI National Fire Bird Conservation Award during the annual meeting of the National Bobwhite Technical Committee in Knoxville, Tennessee, recently. Award recipients are nominated by the respective NBCI-member state’s quail coordinator for their contributions to that state’s efforts toward habitat-based restoration of wild bobwhite populations on a landscape scale. The award’s name symbolizes the historic reliance of bobwhites on fire in much of its range to maintain the landscape in an “early successional” stage, that is, in the native grasses, wildflowers and “beneficial weeds” providing bobwhites with suitable habitat. Both wildfires and fires intentionally set by landowners to clear farm fields and woodlots historically resulted in abundant habitat for bobwhites, as well as other wildlife. The term “fire bird” in relation to bobwhites was first coined by naturalist Herbert Stoddard, who researched bobwhites and worked to restore bobwhite habitat in the early 20th Century. Today, “prescribed” fire under controlled conditions by trained professionals has become an increasingly important tool for helping create and manage habitat for bobwhites, as well as a suite of songbirds, pollinators and other wildlife that require early successional habitats to survive. Phillip Crow of Andalusia reached out to Conecuh National Forest staff 20 years ago to assist, along with his friends, in disking and planting wildlife openings to benefit quail, including purchasing seed and fertilizer when federal funds evaporated. In 2005, he was instrumental in establishing the Conecuh Forest Chapter of Quail Forever, serving as president since its formation. The chapter has maintained more than 200 acres across 100 permanent wildlife openings on the forest, purchased $50,000 in seed, lime and fertilizer and donated approximately $100,000 in volunteer labor and equipment time. In addition to habitat work, the chapter, under Crow’s leadership, has been an effective ambassador promoting quail hunting on the forest, generating local interest and involvement, and sharing knowledge of Conecuh opportunities across Alabama and other states. In 2015, Crow was instrumental in Quail Forever and the U.S. Forest Service formalizing their relationship with a Challenge Cost-Share Agreement, resulting in more effective use of combined resources and better strategic focus of joint management and marketing activities. The chapter also received the U.S. Forest Service’s Regional Forester’s Volunteer Award for its commitment to improving public land resources and recreational opportunities. More recently, Crow worked along Alabama’s state quail coordinator, Mark Sasser, to travel and participate in meetings between the U.S. Forest Service and the Alabama Department of Conservation and Natural Resources that established a portion of the 84,000-acre Conecuh as the Boggy Hollow Wildlife Management Area. This new 7,000-acre WMA is Alabama’s first NBCI Bobwhite Focal Area. With more than 85 percent of Arkansas land being in private ownership, participation and interest in quail management programs by private landowners is essential to the successful revitalization of quail populations. However, examples of habitat restoration must be available and accessible for landowners to demonstrate habitat manipulation necessary for bobwhites’ benefit. The Arkansas Game & Fish Commission (AGFC) recently identified Harold E. Alexander Spring River Wildlife Management Area in Sharp County as a quail focal area for that purpose, based on the habitat management activities coordinated by AGFC Habitat Biologist Rob Willey since his assignment to the region in 2010. Willey has improved more than 1,200 acres of timber, taken out 260 acres of cedar, mulched 270 additional acres of cedar and reclaimed 590 acres of open land, restoring and maintaining critical habitats, specifically woodland, savanna and glades that provide direct benefit to bobwhites and well as other species of greatest conservation need. He has also coordinated similar activities on Scott Henderson Gulf Mountain and Jamestown Independence County WMAs. Willey is an AGFC certified firing boss and prescribes fire treatments and participates in prescribed fire activities on WMAs and cooperative areas across northern Arkansas, assisting in burns totaling 1,511 acres in the 2015-16 season and 3,084 acres during the 2016-17 season on the focal area, in addition to 5,000 acres during those two years on other WMAs. With the responsibility of 20,000 acres of wildlife management area and all the habitat restoration occurring on the state’s Cedar Swamp Wildlife Area Bobwhite Focal Area, Delaware Division of Fish &Wildlife Regional Manager Eric Ludwig coordinates with numerous state and private agencies to maximize his efforts. In the past year he has planted 85 acres in annual and perennial food plots, 103 acres of grass/forb/wildflowers, conducted 153 acres of prescribed burns, 13 acres of timber tinning, 20 acres of fallow disking, 2,000 acres of chemical vegetation control, including invasive species spot spraying, and removal of 200 acres from agricultural lands lease to return to early successional habitat. He also arranged a donation of 3,000 pounds of wildflower seed for the Cedar Swamp focal area, a donation of 10,000 loblolly pines, donations of sunflower seed, and he arranges tree planting and invasive species removal workdays for volunteers, as well as arranging the purchase of new equipment – a skid steer, two tractors and a no-till drill – to assist with management activities. John Seymour/Roundstone Native Seed was honored for pioneering work in the native plant industry in Kentucky, including the championing of native ecotypes, innovating harvest techniques, developing creative seed cleaning methods and their active support of conservation and management of native plants in the state and beyond. Roundstone was an advocate for and key contractor on one of the state’s greatest bobwhite success stories, the establishment of over 100,000 acres of native grassland habitat in the Green River Conservation Reserve Enhancement Program. As the need to manage those acres became necessary and the state’s prescribed fire laws prohibited the private sector from effectively participating, Roundstone became the leading voice for the establishment of a Certified Burn Boss Program through the Kentucky Prescribed Fire Council. Seymour made several trips to the legislature to help ensure the bill’s passage in 2016. 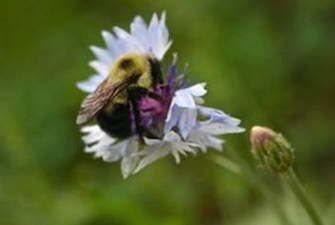 Roundstone is actively engaged in pollinator conservation, including partnerships with the Kentucky Department of Fish & Wildlife Resources, active participation in the development of the state’s Monarch Restoration Plan, and a critical partner on the Perryville Battlefield Grassland Restoration, planting 700 acres in one season, the single largest habitat restoration in KDFWR’s history. Missouri Department of Conservation Private Lands Biologists Tim Kavan and Brad Pobst are responsible for five of the most intensively farmed counties in the state. In the last three years they have combined to write 110 contracts on 3,687 acres under the center pivot irrigation program, in which each 40-acre field averages eight acres of habitat for the combined four un-irrigated corners. They made more than 600 site visits, made over 300 technical assistance contacts and written over 300 plans for more than 50,000 acres of property that addressed 15,000 acres of management under various Farm Bill programs. They also made more than 400 site visits, made 1,500 technical assistant contacts and wrote 200 management plans totaling over 15,000 acres that did not involve Farm Bill programs. 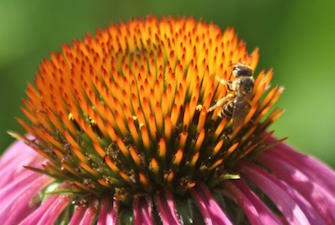 The duo has also been active in outreach efforts, combining to conduct over 50 workshops and field days that reached an audience of 15,000, conducted more than 25 technical training sessions, 14 media interviews, provided a pollinator demonstration with the Delta Center, a youth pollinator demonstration with Monsanto and numerous other presentations for various school, resource and civic groups. They also conduct quail monitoring and provide expertise to Scott County Quail, Oak Ridge and Sand Prairie quail focal areas. William S. Haines, Jr., president of the family-founded Pine Island Cranberry Company (1890) within southern New Jersey’s 1.1 million acre Pinelands National Reserve, was honored for his longstanding dedication to protecting the environment, especially company lands. Haines contracted for a forest stewardship plan, which received state approval in 2005. The plan allowed implementation of forest practices, including prescribed burning, thinning, seed tree cuts and shortleaf pine plantings. In 2011, Pine Island Cranberry was named the state’s Outstanding Forest Steward by the state Department of Environmental Protection. Management activities there created an ideal location to research the efficacy of translocating wild bobwhites from southern states. The company’s partners, including New Jersey Audubon, Tall Timbers Research Station, University of Delaware and the Division of Fish & Wildlife, worked with the Georgia Department of Natural Resources to obtain 240 wild birds over a three-year period beginning in 2015 for release at Pine Island. Results, combined with similar projects at two sites in Maryland, may have broad implications for restoring bobwhites in Mid-Atlantic states where declines have been among the most dramatic across the bird’s range, and will be pivotal to understanding the limits of translocation as a population recovery tool. Wildlife Resources Commission Technical Assistance Biologist John Isenhour’s quality of technical assistance to private landowners in the Piedmont region and his unique relationship of trust with the USDA Natural Resources Conservation Service (NRCS) that has resulted in a positive influence on federal conservation policy in the state earned him the 2017 Fire Bird Award for North Carolina. One of Isenhour’s private land clients won both the Governor’s Conservation Achievement Award and the North Carolina Wildlife Resources Commisison’s Small Game Award. 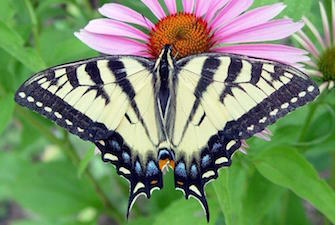 Additional private clients he advises are recognized as conservation leaders in their local communities. He was recruited to serve as a member of the NRCS statewide advisory team developing recommendations to improve the effectiveness of NRCS’s Environmental Quality Incentives Program (EQIP), the largest source of financial assistance for habitat conservation on private lands in the state, awarding nearly $1 million annually for forested and non-forested habitat. He aided in the development of EQIP forestry ranking criteria for the entire state, helping wildlife-friendly criteria become an integral part of the ranking process. His knowledge of and influence on Farm Bill programs and policies puts him in high demand to provide training and coaching for landowners, commission and NRCS staff. “Perhaps one of (his) greatest successes has been his ability to enter the agricultural and forestry community and convince landowners that making a profit can be accomplished while also providing wildlife habitat,” according to his nomination. 50 acres of Old World bluestem and replacement with native grass in the Packsaddle Wildlife Management Area, along with the removal of 3.77 miles of fencing; purchase of a tree saw attachment for wildlife management areas in the southwest region; the purchase of an offset disc for Cross Timbers wildlife Management Area to maintain fire lines; two v-cutter attachments, transfer pump and water tender to be shared within the wildlife manage districts; a V-cutter grapple bucket attachment and the completion of a portable fire suppression skid unit to help control eastern red cedar encroachment in the Cooper and Fort Supply wildlife management areas; burn equipment for the Beaver Wildlife Management Area quail research project; the purchase of 12,500 sand plum seedlings to replace fescue and bermudagrass in the Cross Timbers Wildlife Management area; purchase and outfitting of prescribed burn trailers for the state’s Prescribed Burning Association for conducting burns statewide through local burn associations; purchase of a disk harrow for the Honobia Creek and Three Rivers management areas; a trailer to haul equipment for habitat manipulation at the Grady County and Lexington management areas. Some of the last known sightings of wild bobwhites in Pennsylvania were at the Letterkenny Army Depot, a munitions storage facility in the heart of historical Pennsylvania quail country. 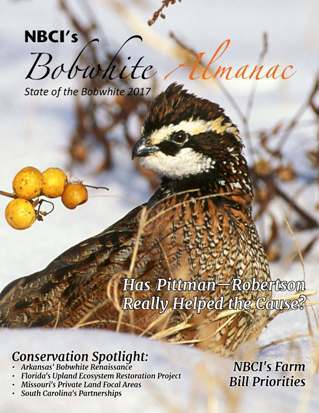 As the Pennsylvania Game Commission searched for a willing partner with the appropriate resources to help bring bobwhites back to the state, Letterkenny stepped up with their own Integrated Natural Resources Management Plan, which identified bobwhites as an important species. And one plan objective is to create and implement a bobwhite quail management plan. Currently in the process of completing a long-term agreement with the game commission, the depot will soon launch its first prescribed fire program to improve habitat conditions for bobwhites and other species. The U.S. Fish & Wildlife Service’s Carolina Sandhills National Wildlife Refuge and its staff took Fire Bird honors for aggressive involvement in and support of a state bobwhite focal area, the Carolina Sandhills Bobwhite Focal Area, on refuge lands. Refuge staff have played integral roles in the state’s bobwhite efforts, with Refuge Manager Lyne Askins serving on the South Carolina Quail Council and Refuge Biologist Nancy Jordan participating on the South Carolina Quail Council Technical Committee, as well as developing a five-year plan for the focal area and helping monitor both the focal area and the required reference area, which is also within the refuge. New hedgerows now break up several expansive fields, management protocols for several timber stands have been changed, required burns have been implemented, winter disking completed, all by refuge staff or retirees. “The South Carolina Bobwhite Initiative is very excited (the refuge) chose to be a part of the initiative and are extremely grateful for the amount of time, effort and fervor they have exhibited in implementing the practices, protocols and changes in management that have occurred since the Carolina Sandhills National Wildlife Refuge focal area was established,” said Michael Hook, state quail coordinator. Over the past decades the Tennessee Wildlife Resources Agency Forest Management Work Unit has made significant contributions to the creation of early successional habitats and grassland restoration, with 6,000 acres of woodland and savanna restored on the Cumberland Plateau. The unit burns 2,000-plus acres per year, primarily related to the restoration of wild bobwhites. Recently, timber sales have been completed on three of four of the state’s “quail anchor areas,” creating or improving more than 1,000 acres of new quail habitat, and smaller scale timber harvests throughout the state have led to increased woodland, barren, glade and savanna habitat creation. Members of that unit are: Brian Chandler, Forest Management Program Leader; Dwayne Robinson, Wildlife Forester 3; Karl Kilmer, Wildlife Forester 2; Justin Hallett, Wildlife Forester 1; Bobby Buttram, Wildlife Forestry Tech 1; Lucas Hadden, Wildlife Forester 1; Justin Walden, Wildlife Forester 2; Kessler Yoder, Wildlife Forester 1; and Wes Tilley, Wildlife Forestry Tech 1. A member of the state’s quail team since 2010, Jay Howell was instrumental in the development of NBCI’s Coordinated Implemental Program (CIP) for bobwhite focal areas in the 25 states. Howell helped lead the state to be one of the first to develop a pilot CIP focal area project and continues to lead those efforts. He has used innovative techniques in helping the state reach its bird and habitat monitoring goals, including the use of a drone to obtain “real time” aerial photos of habitat survey points, allowing a more accurate delineation of habitat polygons (patches) prior to field analysis and greatly speeding up the field surveys. Howell also developed new monitoring protocols in the assessment of bobwhite focal regions and landscapes, and developed an Access-based time accounting system to allow the state team to quickly generate reports on its efforts. Additionally, he served as the chair of the National Bobwhite Technical Committee’s Science subcommittee for two years. SANDY, Utah — The National Bobwhite Conservation Initiative (NBCI) and the USDA’s Farm Service Agency (FSA) finalized an agreement today that paves the way for a closer working relationship on behalf of bobwhite and grassland songbird restoration. The action came at a meeting of the NBCI Management Board during the annual conference of the Association of Fish & Wildlife Agencies at Snowbird Resort here. Jim Douglas, director of Nebraska Game & Parks and vice chair of the NBCI Management Board, finalizes agreement with FSA’s Beverly Preston. 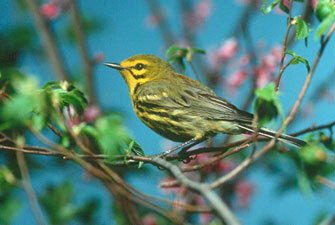 private lands conservation program in the nation, the Conservation Reserve Program (CRP).